That is quite a machine, even with the rack tilted to the rear. In any case, I really enjoyed your story in the Bike Mechanics forum about removing your bottom bracket. For Gnome, my TdF has the full photo on page one of this thread. The SC is down on Page 2. It's pretty much stock and in garage queen NOS condition. Photogravity: The story was utterly true. My wife is still making fun of my wrestling on the floor with that frame to loosen the fixed cup (and failing miserably!). The photo above is taken just after finishing the replacement with a Phil bb and putting new chainrings on the crankarms -- the only original part left. The slanting rack serves a purpose, along with the small rolls of tape up top: to keep my pannier bags from sliding forward and hitting my heels. I had a pair of Kirtlands that I beat to death. Loved 'em. They would slide, tho, without these steps. I'm 33 now, so any bike I had 30 years ago would be a tricycle! And is there a reason you aren't still riding that? It's a fair question. 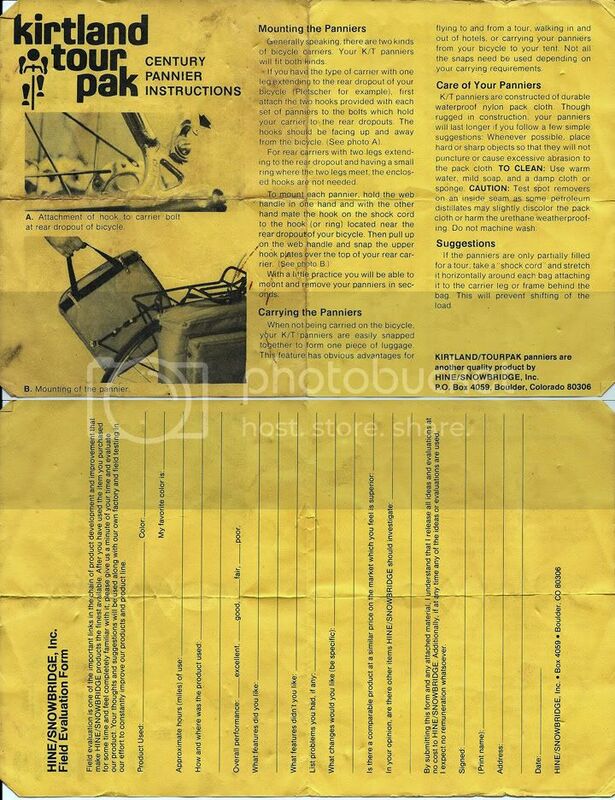 Here's the "instructions" that came with those Kirtland Tour Pak panniers. As I also bought these new over 30 years ago... it's just for amusement. Just think. If I'd given them the full field evaluation report that I should have, maybe they'd still be in business. sigh. Now *that* is a great little piece of information and history to have. I used to hang onto that kind of stuff, but after moving about 10 times in the last 25 years, I gave up on packing and repacking all the things I didn't view as necessary. I hope this picture is from 1975, because it looks mint. I think I just found a new Grail. Can I ask a personal question? Have you designated a beneficiary for this in your will yet? Let me just say, I'm available. LOL! That's was funny. Thanks for the kind words. The picture is recent, relatively speaking. The bike is far from minty. It has been ridden a lot! For example, there are place where is has filiform corrosion beneath the paint ("worm tracks"). This is the second paint job and it honestly could use a third. It might be cool to restore it to its original paint scheme - yellow with white panels and purple pin stripes. I've been collecting pictures or the proper paint job from the web. Maybe someday soon, I'll send it out. Maybe,... It's just that the last time I sent it out, I almost lost the bike. The painter and the shop owner I worked thru were in a bit of a financial squabble and my bike was held hostage. It took many months to get it back. I won't be doing that again. I think I dodged the bullet on this one but I am not sure if that is a good or bad thing. 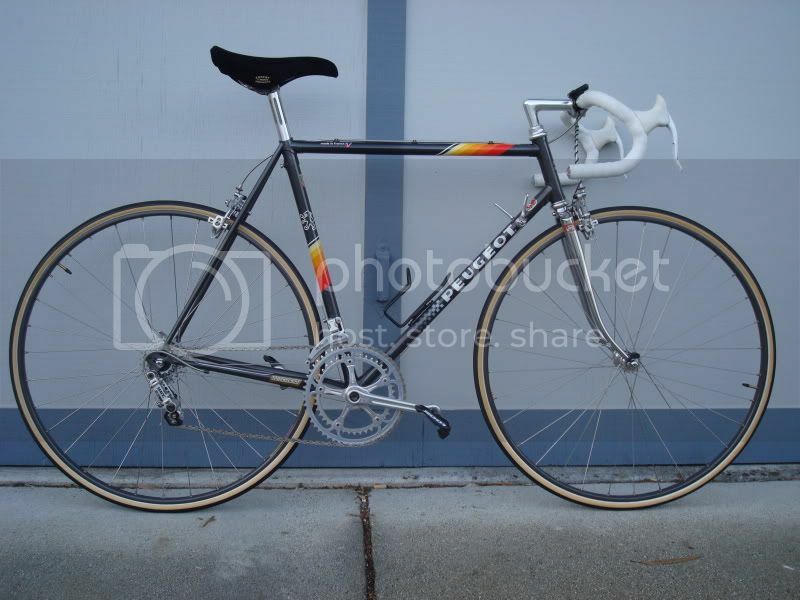 as most of you may know my first new road bike was my '87 Bianchi. when I was in school and riding my Royce Union (see I wasn't always a bike snob) when I would go to the LBS for service I would look over the the new parts, Cherry Hill brakes Zefal pumps (you know the ones theywere like 4 or 5 on a display card and they had the little hoses) and Bikes. there was this one Kent that always caught my eye. so if I had bought that bike would I be Kentgirl today? or even worse Trekgirl OY! Not 30 yet, but I bought my '84 Grand Prix new in '85 to rehab a broken leg and still have and ride it. It was my first "real" bike after getting my first "real" job. How bout 29 years ago? I still have, and ride, the Ciocc I bought in the spring of 1983. 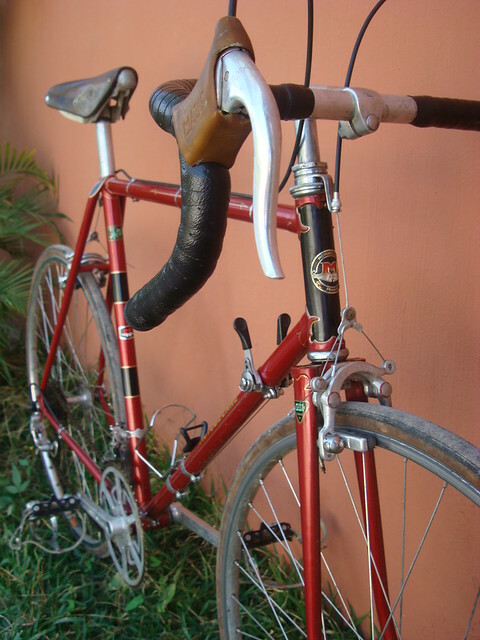 Actually, that was just the frame and fork, the hardware, (Campy SR and NR), came off my Gios I built in 1980. Have the 1971 Peugeot G50 my dad bought me new, 41 years ago. Obviously I can't ride it any more. Also the 1992 Bridgestone MB-Zip I bought new, 20 years ago, and the wife's Bridgestone MB-5 bought about 19 years ago. This is my 1973 Fuji Finest that I bought new while I was in college. I bought this for $300 which was about the same amount of money for one semester of my college tuition. When my father found out that I spent this amount of money for this bike, he was very upset with me. I felt some what guilty after that so I took good care of the bike while putting on a lot of miles using it as my primary mode of getting around. I still ride it frequently. I upgraded from the original Suntour components (still have them in a box) to Campagnolo. Overall a great comfortable ride. I still have a Schwinn 1982 voyageur S/P and ride it once in awhile. I bought my 1974 Peugeot PX10LE new. It has been rebuilt a few times. It's pretty much a wall hanger after the last one. I don't want to damage that DR. Deltron paint and I have other bikes that I enjoy riding more. This story is not about a new bike, but the bikie parts bin equivalent of Johnny Cash's "One Piece at a Time." I am the proud owner of a battle-scarred late 1970s black 59cm Albert Eisentraut, which I bought as a bare frame from its first owner (5' 9" tall) in about 1984 for $75 after he crashed it drunk, bent the fork and wrinkled the TT. I straightened it and built an upright bar commuter with mostly free used parts from the shop I worked in. Its hallmark features were the Gepiemme track crank with 42T chainwheel, Campy steel road pedals (was a time you could hardly give those away), Shimano Crane deraileur with single bar-end shifter, tied-and-soldered 27" Rigida rims with high flange hubs, single Shimano 600 front brake, and Unicanitor track saddle. 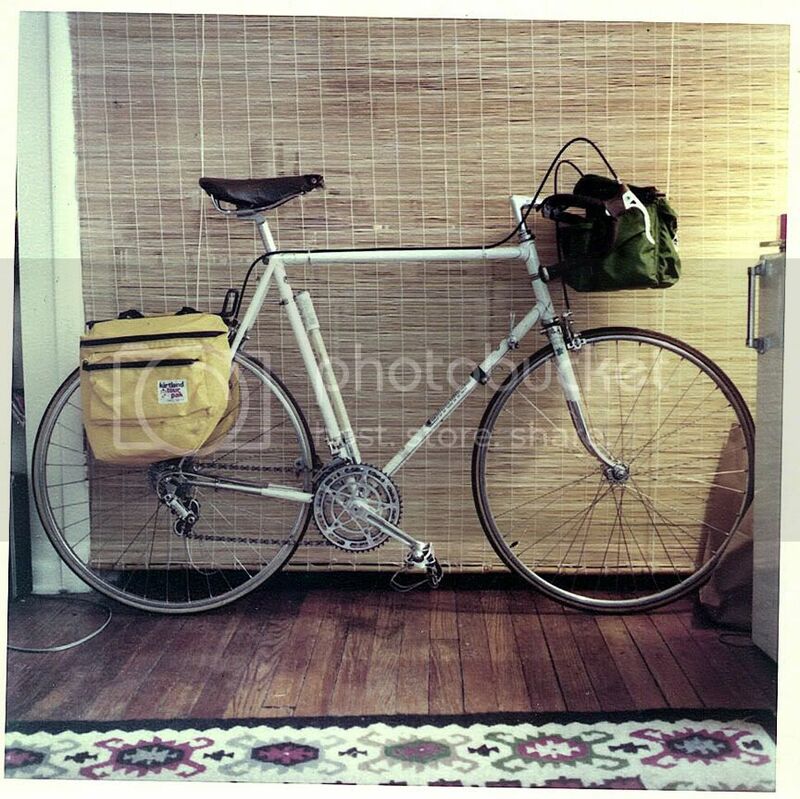 I rode it to class in graduate school, off road in the Rio Grande cottonwood bosque, and later as a shopping bike. Other than better wheels and saddle and a rear brake it has stayed pretty much like that since. Sometimes I think about repainting it to its glossy Imron glory, but I'm too attached to its patina, and the memory of the fun of scrounging together a bike for under $100. So instead I overhauled the pedals, freshened the cables and put on new/old VO levers: ready for my last 20 years on a bike. Maybe I'll be buried with it. Not quite 30 years old at 28, my 1984 Peugeot PSV has been with me since I got it from a Peugeot dealer in Appleton, Wisconsin (Nordik Ski and Bicycle shop)...in 1984.... I even have the receipt for the bike somewhere in my stuff. It's been through 28 years of modding up though and pretty much lost all of its original components, except for the seatpost and brake cable casing and headset, in those 30 years....and I bet i'm not really done with it yet! Last edited by Chombi; 04-12-12 at 12:00 AM. Lots of French bikes here, I wonder why that is. Here's my 1975 Motobecane Grand Jubile, I bought it new in '76 with money I earned working on my uncle's farm. 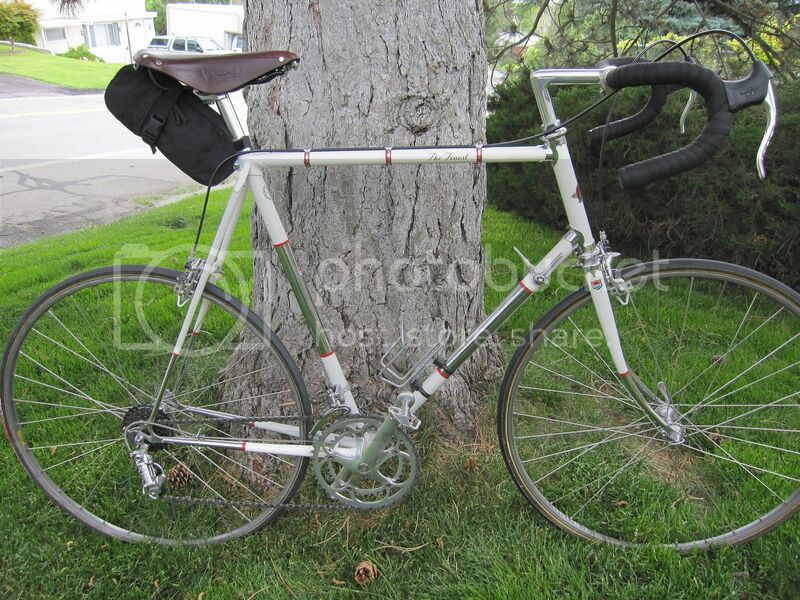 It was my commuter, recreational rider, and tourer in high school in Mankato, MN. It was stolen in 1977 but I got it back. Later my sister rode it in college, then it was my commuter for a while in Minneapolis. After that it was a garagequeen at my folks' place, but I always rode it when I visited. I recently did a complete refurbishing, refinishing the frame and replacing nearly all the parts. At the moment it's my main recreational rider once again. At the moment it has a rear rack, fenders, and a handlebar bag. Last edited by kroozer; 06-09-13 at 08:13 PM. 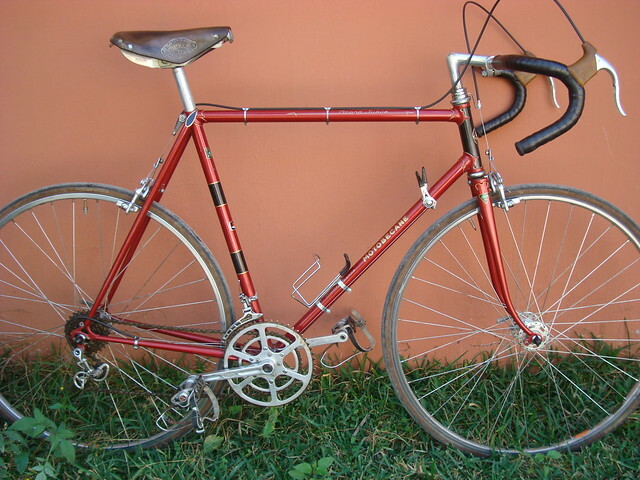 I bought my Atala Pro in '73 and my Stan Pike in '82. Still ride 'em, though I've semi-permanently given the Atala to my beautiful wife - miraculously, it fits her. I do have 3 bikes bought new in 1974, a Super Course my uncle gave me and 2 Raleigh Sports that belonged to my parents. Darn. I have to wait four more years until 2016 . . .
You wouldn't by chance have a spare Kirtland pannier would you? I have one in dark blue (right side I think) and my grandfather had the other-we shared a pair when we rode from Paris to the Mediterranean in '85-and it has been lost from history. Nice bike BTW! Last edited by ACH57; 04-12-12 at 09:19 AM. Because the French bike industry was on top of their game at the time! Great bikes, not too expensive.